Everybody wants to be rich, and live with a lot of wealth and luxury things. And we know there are many ways to get rich. Even though investing is one of the smartest ways to grow your wealth, it's not the only way to get rich. Some lucky people can get rich instantly because they win lotteries like powerball or mega million. If you want to try your luck to get rich instantly like them, jackpot Mega Millions now offers a prize up to $ 1.6 billion. And from many Powerball's big prizes around the world, numbones.com takes the top 5 biggest prizes. And if you become one of the winners of the powerball, I am sure that you will live with a house and a luxury car right now. Lottery winners such as powerball or mega million can choose to receive money in annuities, or an annual quota of more than 30 years, or it can be to get all of their prizes in one payment in a smaller amount. For example, the number of powerball prizes as well as the $ 1.6 billion jackpot is $ 904.9 million. If a winner takes a single or simultaneous payment, then federal tax deductions will be more than $ 217.2 million. Apart from federal taxes, there can also be state tax. But even so, it doesn't seem like a loss if it is compared with the ticket price which is only $ 2. With $ 2 you can buy your luxury house or luxury car. And you can make your dream come true. For the Powerball lottery, there are three winning tickets for the biggest prize in history, drawn on January 13, 2016. And this prize is the largest Powerball jackpot ever. The lucky ones were John and Lisa Robinson in Tennessee, Maureen Smith and David Kaltschmidt in Florida and Marvin and Mae Acosta in California. All of them have a prize option of around $ 533 million before tax as an annuity, or $ 327.8 million as payment at the same time. And do you know? The Robinsons winning ticket is one of four tickets they bought at a roadside grocery store. They agreed to choose to take a lump sum only. Because John stated that they won today, but maybe not for tomorrow. Therefore they took the prize at once. And for Florida, Smith and Kaltschmidt also choose lump sum just like John. With the instant wealth of the Powerball property at that time, they planned to get some massage, upgrade their trucks and retire with the new wealth they got. Then the winners from Acostas remained anonymous for months after winning, but they released a statement saying they were grateful for the rare gift they had received. The winner who won the second largest powerball prize in the world is Mavis L. Wanczyk from Chicopee, Massachusetts. She claimed that the prize she got from the Powerball jackpot was valued at $ 758.7 million in August 2017. And shortly after she won the lottery, she called his employer at Mercy Medical Center, where she worked for 30 years, and she said that she quit from the job. On media, she said that she had called the place where she worked for 30 years, and she told them that she would not return to work there. She decided to take a lump sum for the Christmas gift, she received a $ 480.4 million prize before tax. With such a large gift, it was appropriate for her to think that she did not need to work again, and live with the wealth that she gained instantly for the rest of her life. One of the Mega Millions lottery prizes is also included in the category of the 5 biggest lottery prizes in the world. Recorded in March 2012, Mega Millions had three winning tickets which received a total prize of $ 655 million. The Mega Million winner in March 2012, the first was Illinois Merle and Patricia Butler. They claimed that they got a prize of $ 218.5 million from the victory of the Mega Million lottery. Then in Maryland, states that allow the identity of the winners of both lotteries to remain anonymized. Three school employees claimed their victory by the name "The Three Amigos". The third lottery winner is in Kansas, but like in Maryland, the third winner's identity remains anonymous. The millionaires who won $ 647 million from Mega Millions this time are Ira Curry from Georgia and Steve Tran from California. They were recorded as having won the Mega Millions lottery in December 2013. Like other instant millionaires, Tran immediately called his boss to say that he wanted to stop working after he got this Mega Millions jackpot. The Jennifer Gift Shop is a place where Tran buys several lottery tickets, and this store receives $ 1 million for selling lottery-winning tickets. Then for the other lottery winners, Curry bought the ticket as a last minute decision. And fortunately he chose a combination of family birthdays and number seven who were lucky to make him the lottery winner. Both Ira Curry and Steve Tran both left with a lump sum option worth $ 172 million. Then the fifth Powerball lottery biggest prizes had a prize of $ 590.4 million. Recorded in May 2013, Gloria Mackenzie in Florida won the Powerball jackpot worth around $ 590 million. The victory at that time first made history the biggest jackpot won by only one person. And he chose to receive a one-time prize payment of around $ 370 million before tax. That was the five largest lottery prize list in the world. They must be people who are very lucky because they can get such a big prizes instantly. To be able to win the powerball or mega millions lottery, of course we have to know the rules. Both Powerball rules, as well as mega millions rules, may not have much difference. What is certain is that we must always check our powerball numbers properly. Or maybe these winners have a certain strategy to win the lottery? If there is a chance, maybe we will ask them how to win Powerball with such a big prize. Do they have a specific strategy, or is it just pure luck. Because we certainly know that to win the Powerball jackpot number is not easy. But we need to remember, though that the prizes offered in the lottery are very large, but that prizes cannot be easily obtained by everyone. Only people who are lucky enough who can get it, and the comparison can be said to be very small. So if you want to be rich, start to work seriously, then you can start investing, or you can make your own business. With hard work, wealth will surely be achieved with certainty. That's better than trying your luck from the lottery. 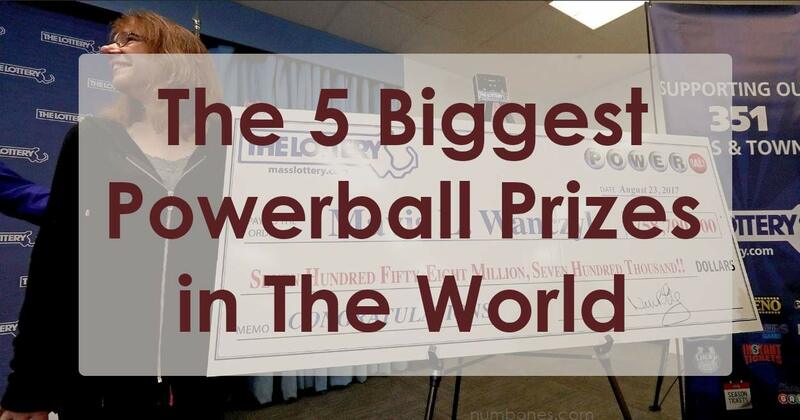 0 Response to "The 5 Biggest Powerball Prizes in The World"